I hope you're enjoying all these giveaways. Let's continue the celebration with Paloma's Nest! Known for their gorgeous ring bearer bowls and sweet heirloom pieces, Caroline is offering one lucky P&P reader a chance to win the "Forever Yours' ring bearer bowl. The bowl is hand crafted of fine white clay and comes from their Calligraphy Collection in which they collaborated with Moya Minns of MM Ink. Make sure to stop by their flagship showroom if you're ever in the Austin area. • visit Paloma's Nest website and leave a comment with your favorite item. Giveaway ends on September 10, 2011 at 5 pm EST. Giveaway has ended! My favorite is the "The Sun, The Moon and The Stars for You" Ring Bearer Bowl! Love it! The dress hangers are perfect! Favorite is the "Forever Yours" bowl...such a cute idea!! oh i love their cuff link sets, the black stamped ones especially. so classy. I like Paloma's Nest on Facebook! 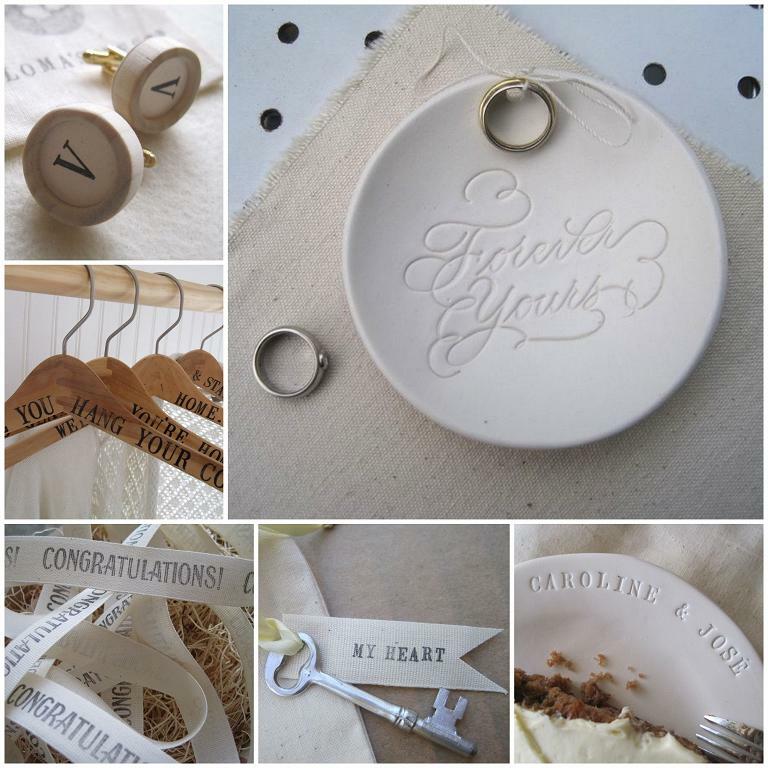 I LOVE all of the ring bearer bowls...the Forever Yours is a great use of typography and space! I love the "Forever Yours" bowl. It is beautiful and would make a wonderful keepsake as well! Let Love Be Genuine is my favorite bowl, but it wasn't easy to pick. I like the where we met map! That would be Wooster, OH! I am a fan of Paloma's Nest on FB! The forever yours bowl would have to be my favorite. LOVE the new custom bouquet tiles! Adorable and perfect to add more love to a bride's bouquet. The use after the bouquet is endless too! i love the "where we met" map keepsake. such a cute idea! The "I carry your heart" bowl is the sweetest! I love that sentiment. I liked Paloma's Nest on Facebook. That "Forever Yours" bowl is just so gorgeous, I can feel my heart melt. Swoon! Oh, and you know I stalk you on Twitter. Don't worry, it's with great affection. I love all the ring bearer bowls! Especially Let Love Be Genuine. I like CUSTOM bouquet text tile charm/ ornament. I have never seen these before, too cute! The inscribed monogram cuff links are adorable. I'm actually thinking of getting them for the groom for a wedding I'm about to be in. So so charming. Loving the cufflinks! It's nice to see a lil' something for the boys since weddings can be overwhelmingly all about the guys! Follow Paloma's Nest on Twitter. Liked Paloma's Nest on FB! Ohhh I love Paloma's Nest! I love the wood hangers! Are those new? love the personalalized ring bearer bowls! I'm an ee cummings fan, so I like the "I carry your heart" bowl. So charming. I'm a new follower/liker (#498) of Paloma's Nest on FB. Thanks for such a nice giveaway and for introducting me Paloma's Nest products. I visited the site...and I really love the simple idea of the "building block" for your child....such great life lessons on a block they can hold in their hands...so sweet! I like Paloma's Nest on Facebook! Thanks so much for the chance!! My favorite PN item is the gilded ring bearer bowl... but I would get custom text! I also follow minted on twitter. I do love the classic to have and to hold bowl - perfect sentiment for ring holders! We're planning to do a "ring blessing" ceremony and this would be perfect to hold our rings and pass around through our guests! And I already like Paloma's Nest on FB! i love their heirloom bowl! E.E Cummings is amazing & so is this precious ceramic bowl. I love the Custom maple wood dress or coat hanger. The bowl is such a great idea for our wedding too! I love the custom cake plate! I love gilded dove Ring Bearer Bowl. my fav is the cake plate with names and wedding date. what a great keepsake! My favorite is "Two Branches One Tree" - love it! Following Paloma's Nest on Twitter. I am in love with these ring bearer bowls! So elegant and simple :) Perfect for our wedding! Following Paloma's Nest on Twitter!